I am a bad bad blogger!!! Shame on me. Honestly there has just been so much going on I haven’t had a second to post but I am fixing all that today. So it’s going to be a long one with lots to see and hear about. Stay with me ! I’ve been blessed to be doing some designing for the girls over at Scrapadabadoo.com. If you haven’t checked out their store get over there and do some shopping! So here’s some of the fun stuff I got to use. Kaisercraft came out with these great little chests at Winter CHA. 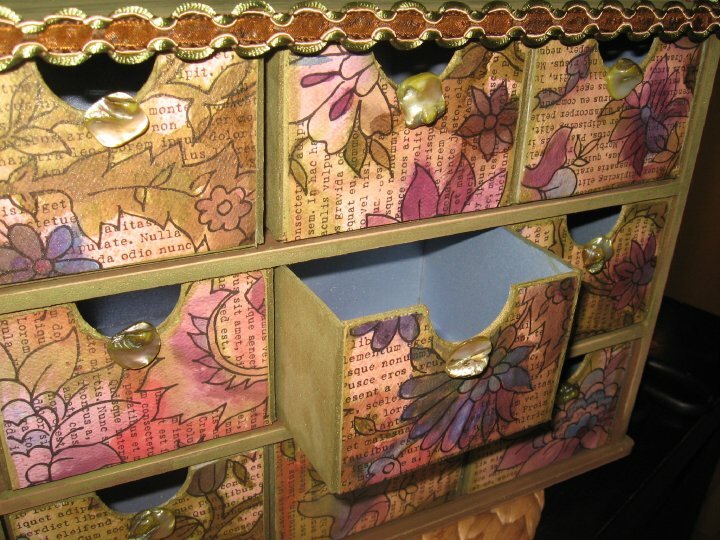 You simply snap the sides together and then decorate up these drawers to suit your taste. 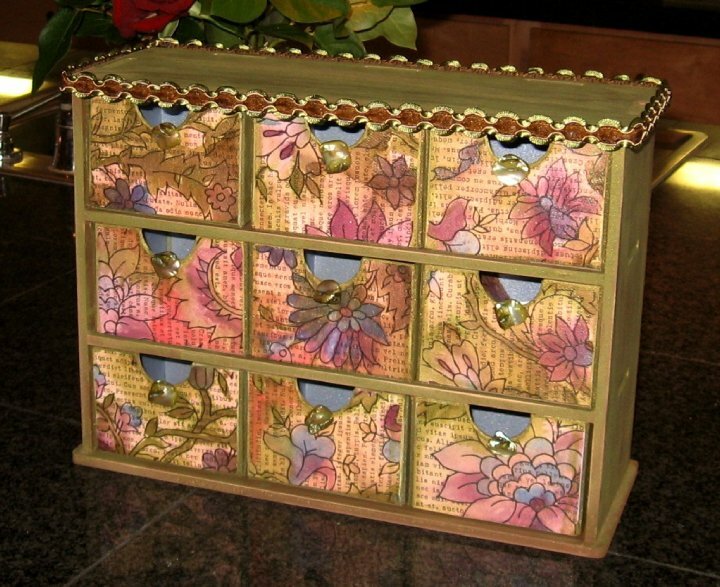 It was the perfect project to use Prima’s Paintables and my growing collection of Glimmer Mists on (swoon!). Just one 12×12 Paintable was enough to do all the drawers. I used Glimmer Mist in Olive Vine to paint the outside of the drawers and sprayed Waterslide on the inside for some contrast. The other colors I used were Starfish, Wheatfields, and Haunted Shadows. I painted the box with a chocolate colored acrylic paint and then added some olive-green over the top, sanded it a bit and it was done in about 10 minutes. I added some organic looking green gems from Michaels for the drawer pulls and some new Webster’s Pages trim around the top. Mia wanted to give it to her teacher for Teacher’s Appreciation week so the chest had found a wonderful home! Next project…PUNKY SPROUTS album! WhoooHoooo!!! I’ve been salivating over these albums for weeks. Chipboard, acrylic and canvas all in one album…how can a girl resist? I have two going the Prim and Punky and the Rebel Sprout but the first one, the P&P is ready for a couple sneak peeks! Here it is…Chasing Butterflies. Just before we left on vacation at the end of March we had the prettiest day here. Mia and I were out in the backyard hanging out and she had a Prima butterfly in her hand and was running and spinning and clipping the butterfly on all the flowers and trees. I was so much fun! My daughter and I, in the late afternoon sunlight, laughing and just hanging out. Those little moments with her are the ones I want every day. Since we don’t always have that kind of time I thought it was the perfect set of pictures to use in an album. Stay tuned for the finished album pictures this weekend…. and make sure to pick up your own Punky Sprouts album over at Scrapadabadoo.com! Another project that has come my way has me very excited. I am going to be helping out over at Artist 365 on Facebook. Look for my monthly challenge event to be posted tomorrow! Each month I will give you a song to inspire you. Listen to it, read the lyrics, look up the background and Feel the Music. This is a free-for-all challenge, meant to be totally inspirational and open to any and all mediums. So all you poets, painters, photographers, jewelers, scrappers and mixed media creators please join me and the folks at Artist 365 for some fun! Make sure to check out the other events and goings on as well. What do I love about mixed media? A mixed media piece can be as simple or as complex as you want to make because there are no rules. It’s a great way to try new techniques and just have fun! Creating at it’s best, no limits and no boundaries. What’s not to love? I had never used beeswax for collage before but was intrigued by the beautiful, murky layered effect it produced and thought it would be great to try on this canvas. My daughter is truly the light in my days and the quiet peaceful place in my nights. She’s been learning to swim and has decided that being under water is pretty magical and pretending to be a mermaid is certainly better than living on land with just plain old feet. 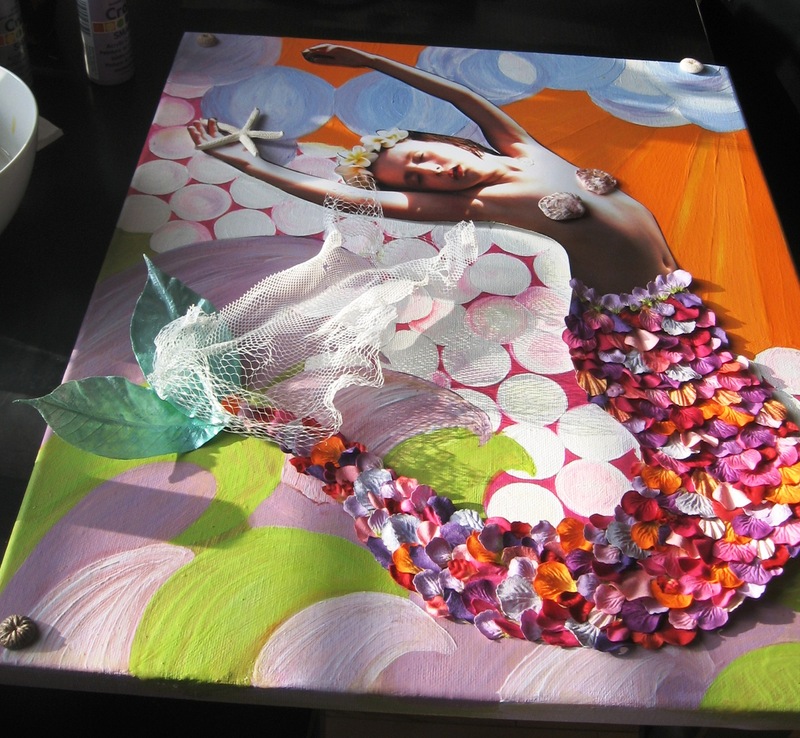 I want to remember the mermaid in her forever so this project was planned to freeze her just as she is now at six, wild, wonderful and full of imagination. I knew I would need a picture of her in a certain pose, one that would make her look as though she was leaping out of the water once I added her mermaid tail. I had no problem having her do a quick photo shoot by the pool on vacation, but I did get some pretty strange looks at the photo counter when they realized I was the one with the half-naked 11×14 print! I chose a 16×20 primed canvas and positioned her on it. 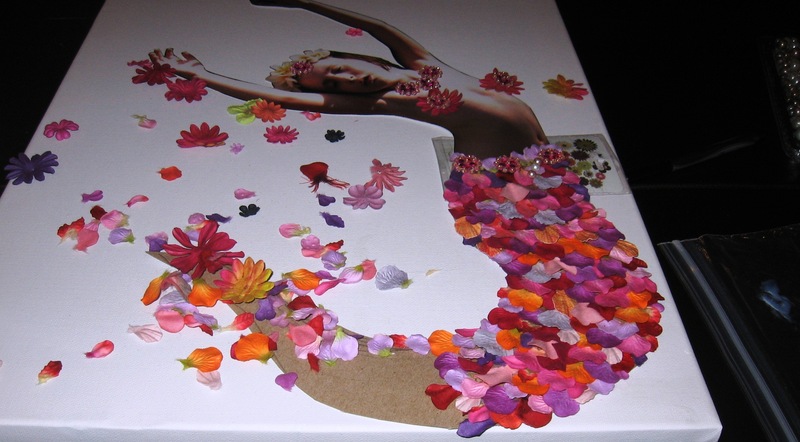 She’s all about pink so I used a combination of pink, purple and orange Prima flower petals layered over a cardboard cut-out for her tail. I sketched some geometric shapes around her body and used acrylic paint before attaching her to the canvas. Then the beeswax came out and the real fun began! I melted it slowly in a double boiler but there are special pots available for this as well. 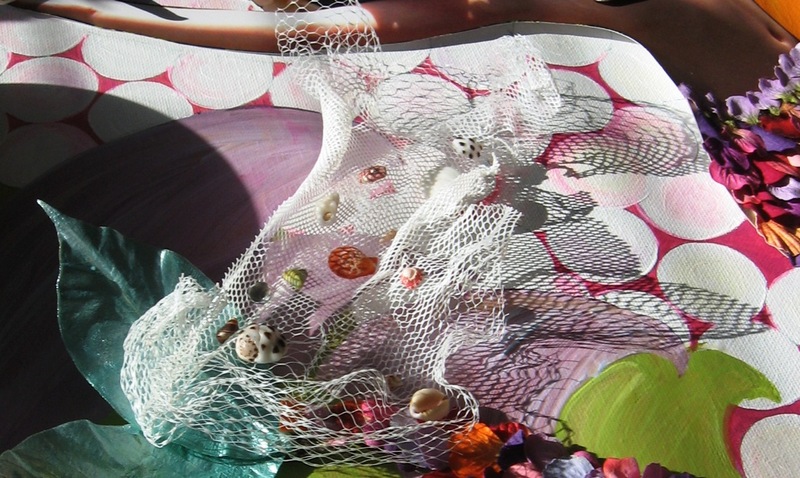 Once melted I brushed over the canvas including the picture and the tail and then began adding on some Paper scraps, netting, crushed sea glass and shells that we collected in Hawaii. I pressed the items into the wax and let it harden. I applied another coat to seal everything to the canvas. If the wax looked to thick I simply used a little blast from my heat gun to melt it again and was easily able to move both the wax and the items in it around to suit my taste. You can use almost anything to create texture in the wax. I used a fork and the back of a shell to create some additional pattern and dimension. Finally I rubbed in some shimmering Perfect Pearls to give everything a subtle glow. I used my heat gun to melt the wax again in certain areas and let the was pool and swirl to look like water. If you haven’t tried working with wax I encourage you to try it out. I can’t wait to keep experimenting with this technique! That’s all for now. Thanks to all my follower and friends for stopping in to check out what I am doing! 3 Responses to Show and Tell time! Stunning canvas!! I tried beeswax but was too impatient. I’ve been wanting to try it again and now I’m really inspired. Thanks for sharing – and linking us up over at SNR! Leslie – as always you continue to amaze me with your talent! These are just amazing and so beautiful!! It is so artistic . What a Wonderful treasure for your Daughter. Your love for her is in every detail of this Canvas art.